Sega releases two old and crusty puzzle games on iPhone. Withhold applause. Columns and Puyo Pop are two puzzle games that achieved moderate success in the 90s and beyond. 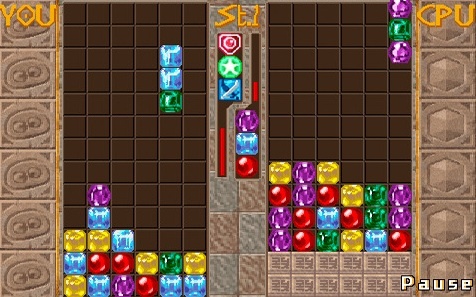 The former challenges you to stack similarly colored gems to make them disappear, while the latter tasks you with grouping similarly colored puyos to make them disappear. Both were addictive for about 30 minutes and then we tossed them aside for Tetris. Well Sega wants to keep the flame burning by releasing SEGA Columns Deluxe for iPhone, a cheap port that rekindles our boredom. Had Sega spruced up these games with snazzier graphics and music, this package could have been one of the platform's best puzzle games. Instead, it shoved the originals onto the iPhone in a $4.99 bundle, a moderate amount considering Bejeweled 2 costs $9.99, but Bejeweled 2 is good, and Columns Deluxe isn't. Watching Genesis quality graphics on our glorious iPhone screens makes us sad, as does listening to the ancient music. Same goes for the gameplay, which features touch screen controls. Although maneuvering gems and puyos with our fingers and adjusting their position by tapping the screen is a novel idea, the controls don't feel nearly as responsive as Bejeweled 2's. Furthermore, both games are too slow. It's difficult keeping our eyes open while watching 16-bit rocks and blobs slowly making their way to the bottom of the playfield. Both Columns and Puyo Pop aren't bad games, but they're not nearly as sweet as the competition. Even at $4.99, it's hard purchasing this bundle when Bejeweled 2 is $5 more. We're all for Sega re-releasing its classics, but there are plenty of better games. Sorry, but we'll stick to Tetris. What's Hot: Puyos are cute. What's Not: Boring games, sub par graphics, moves slower than dead people.